NPR Taste Test: Upside Down Cake To Turn Your Holiday Party All The Way Up Pastry chef Aggie Chin talks with NPR's Ailsa Chang about sweet treats to prepare for your holiday party. 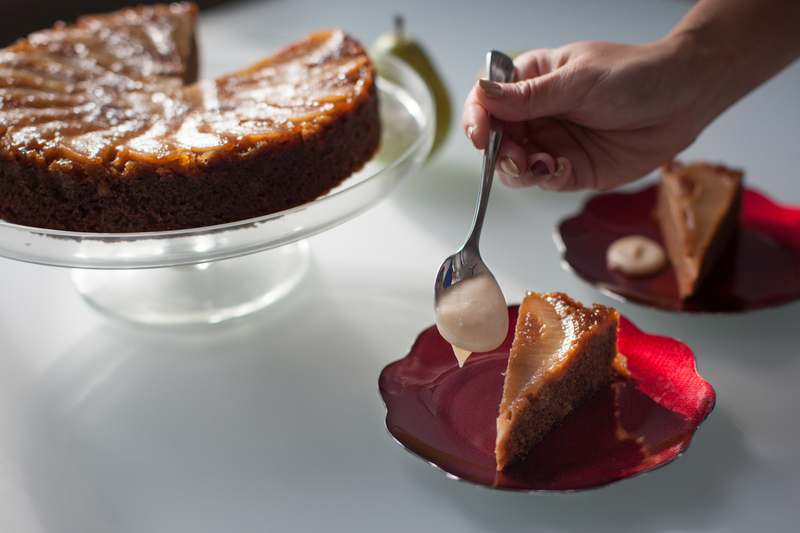 This week, it's pear upside down spice cake. 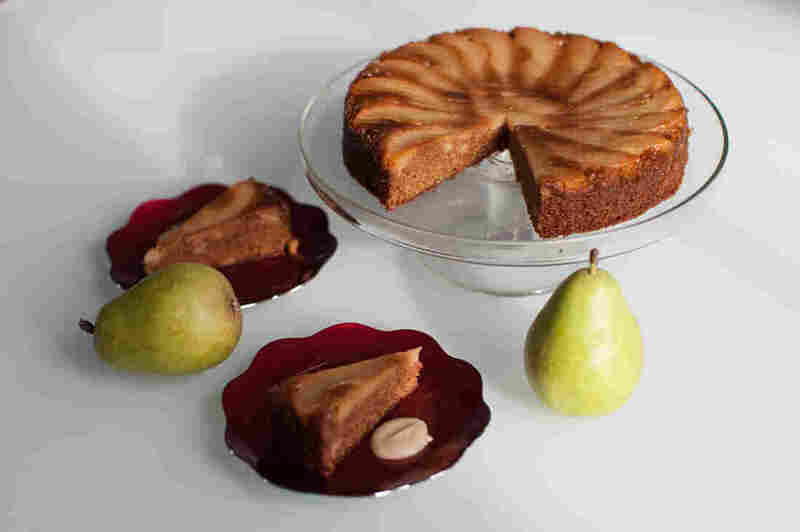 Pastry chef Aggie Chin's Pear Upside Down Cake. We met up with pastry chef Aggie Chin again this past week to bring you her recommendation for a family-style dessert perfect for a holiday dinner: pear upside down spice cake. She cooked this delectable one in a kitchen with NPR's Ailsa Chang. Listen to their conversation at the link above, and check out the recipe here. 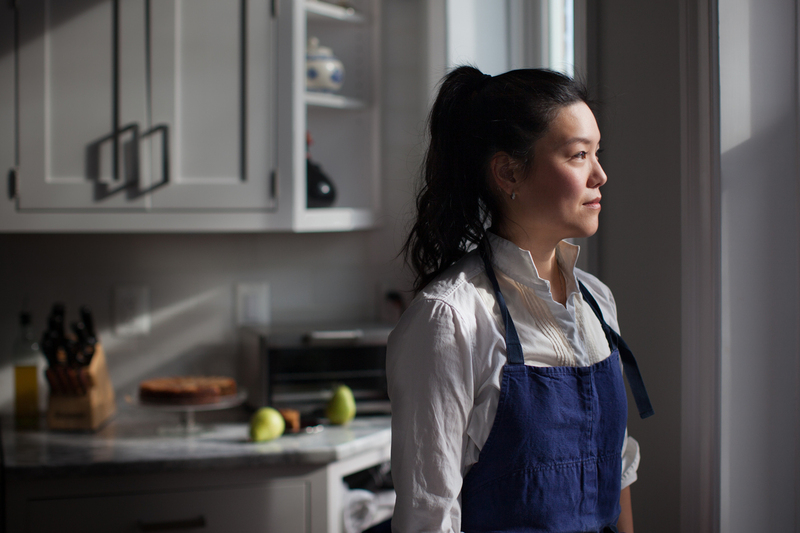 Pastry chef Aggie Chin is based in Washington, D.C.
Aggie Chin adds lightly whipped cream to her pear cake. Grease and line a 9" cake pan with parchment paper. Peel and core pears. Slice them about 1/4 inch thick, and arrange the slices on the bottom of the cake pan. If you want to cover the pears with caramel, combine 2 oz of sugar with a little water in a saucepan to make a slurry. Cook over medium high heat until the sugar caramelizes. Add the butter and stir to combine. Add the vanilla and then pour the caramel over the pears. Set aside. In a mixer fitted with a paddle attachment, cream the butter and sugars until light in color. Add the oil and yogurt and mix until well incorporated. Add the egg. Once fully mixed, add the pear or applesauce. Add the dry ingredients and mix on low speed until just incorporated, finishing by hand to ensure it is not over mixed. Spread the batter evenly over the pears and bake until it tests clean and pulls away slightly from the sides of the pan. About 30-45 min, depending on the oven. Let it cool for about 15 min before inverting onto a plate or cake stand. Serve with lightly whipped cream or vanilla ice cream.